I'm one of those people who sometimes doesn't know how to let things go. Whilst I don't hold grudges, I do have a problem when it comes to recipes and foods. You see if something doesn't work out the way I wanted it to or there's a food I don't like when trying it for the first time, I can't give up. I keep on trying. I find myself determined to fix things so that I will like them. Case in point? 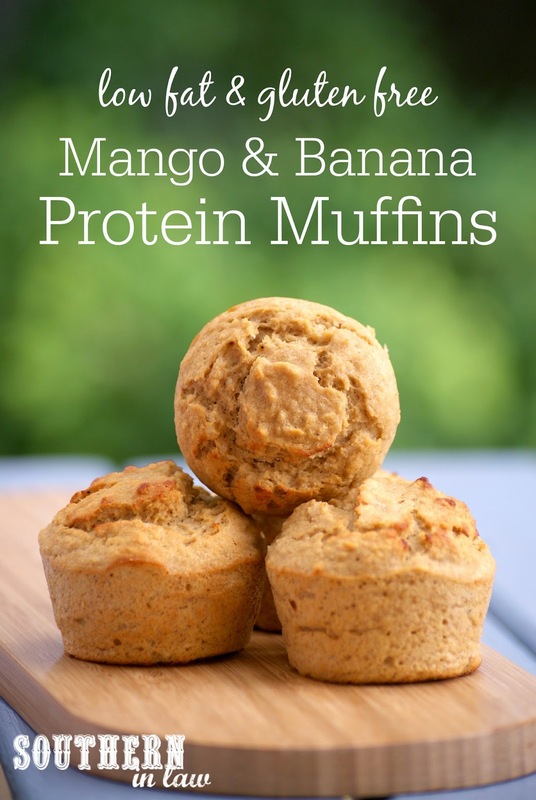 Last week I told you how I thought protein powder was disgusting - and this week I'm sharing a protein muffin recipe with you that contains protein powder. I had a big ol' bucket of protein powder that I didn't like on its own or mixed in smoothies, but I knew I could find a way to make it work. There was one protein powder that didn't get that far, but I knew Growing Naturals' Original Rice Protein Powder had potential. I was going to make it work. And ohhhhhhhhhhhhhhhhhhhhh baby baby did I do just that. 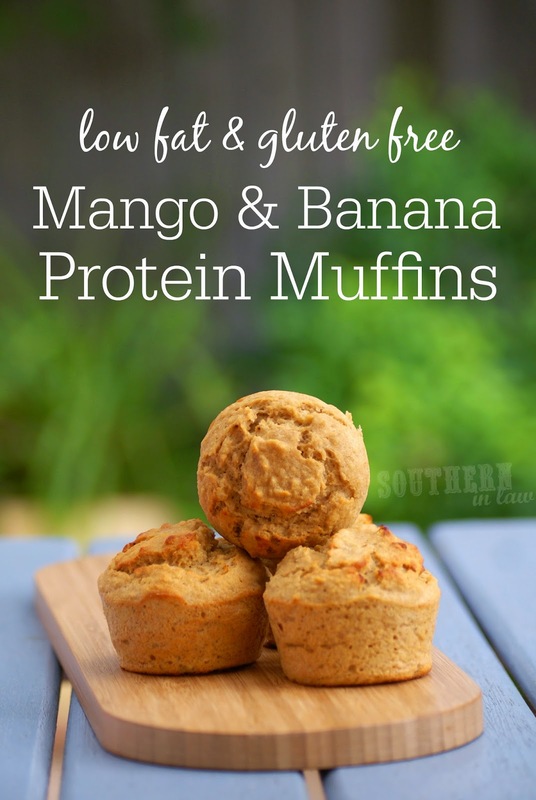 With a gigantic ripe mango sitting in the fridge and brown bananas in our fruit bowl begging to be used up, I set to work on creating some protein muffins. I had three aims in particular; they needed to be high protein, they needed to use the protein powder in an undetectable way and they needed to taste amazing. No pressure, right? The pressure may have been on, but I do well under pressure and these muffins were even better than I expected - so much so that I rushed out to the store to get more mangoes and bananas and have made (and devoured) three batches since that very first one. 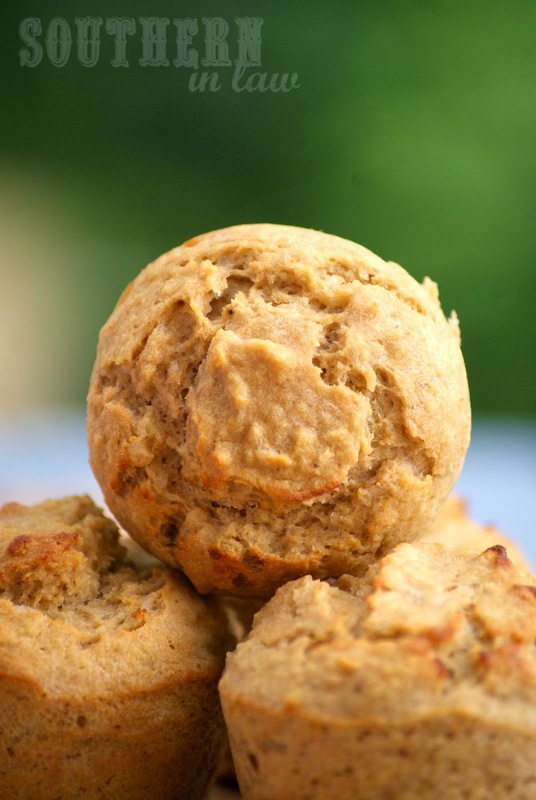 Unlike most protein muffin recipes, these are fluffy and light and delicious (not dense and blah like others I've tried) and no one would have any clue that they're jam packed with protein. Each of these little beauties has over seven grams of protein in them and only around 85 calories - so you can grab a couple for a quick, easy and filling snack! Grease 12 muffin cups/tins with butter or non-stick cooking spray. Pour your mixture into your prepared cups/tins, filling about 3/4 of the way full. Bake for 15-20 minutes or until cooked through and a skewer inserted into the centre of one of your muffins removes clean. Allow to cool before serving or storing in an airtight container. These will keep for 2-3 days in an airtight container at room temperature, up to a week in an airtight container in the fridge or for months if frozen. *Nutritional information was calculated without optional sugar and using quinoa flakes. **Not all coeliacs can tolerate oats. Find out more about oats on a gluten free diet here. ***The weight of your protein powder will vary depending on which protein powder you choose to use. 1/2 cup is generally just over two scoops of protein. ****If your protein powder is sweetened, you'll probably find it's sweet enough without the additional sugar, however, if you like your baked goods sweet be sure to add it in. We found these muffins were sweet enough just using the mango and banana as we don't like things too sweet, however, some of our family and friends preferred the sweeter version. What's your favourite snack at the moment? But wait - don't you eat chicken? Or have I lost it completely!